Simple, clean lines are punctuated by a rich smoky arabica finish on oak veneers which showcase the inherent beauty of the wood. 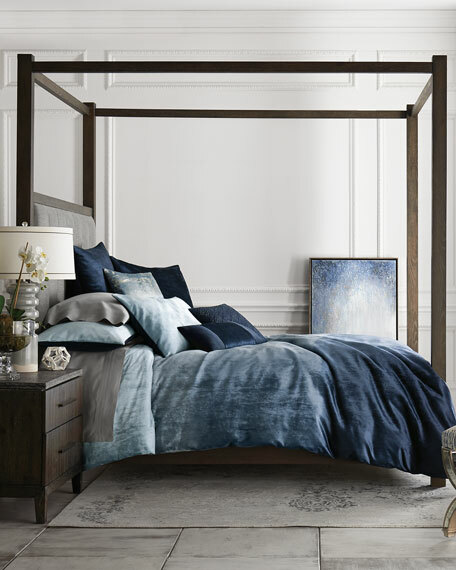 The headboard has an inset, channeled, soft gray performance fabric for an updated feel. The tall posts and canopy combine to form a striking silhouette. 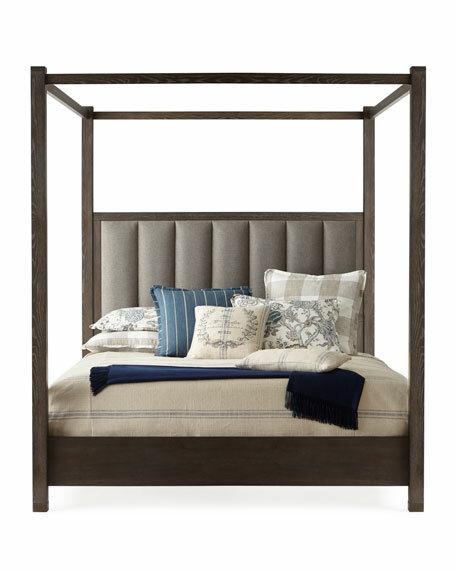 Handcrafted canopy bed with channel tufted headboard. Rubberwood solids, hardwoods and white oak and pine knotty oak veneers. Performance fabric on the headboard for added durability, cleanability and color fastness. 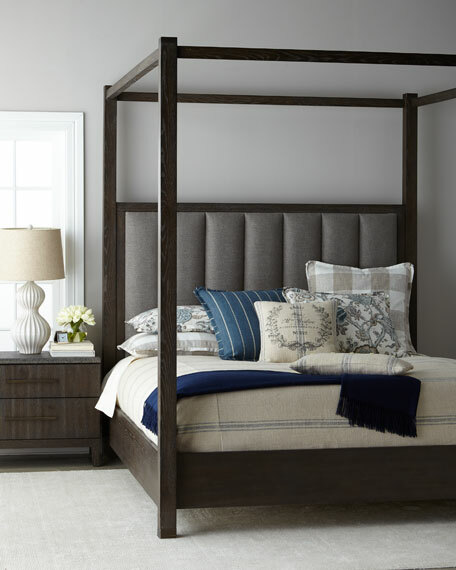 Light assembly required to connect headboard, footboard, and rails. 79.5"W x 93.3"D x 90"T.
63.5"W x 89.3"D x 90"T.
Boxed weight, approximately 284 lbs. 79.5"W x 89.3"D x 90"T.
Boxed weight, approximately 326 lbs. 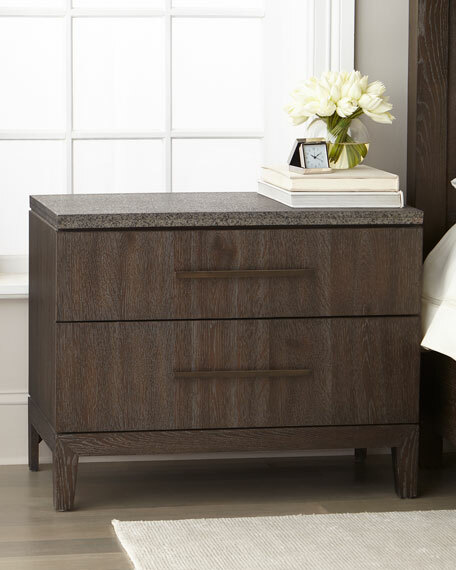 This trendsetting two-drawer night stand utilizes a rustic oak wood in a smoky arabica finish highlighting the beautiful grain patterns of the wood. 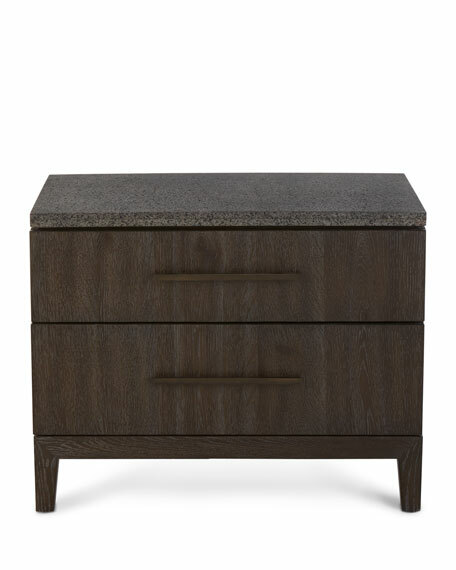 Completed with a sandblasted, textured blue stone top, two self-closing storage drawers and an electrical outlet. 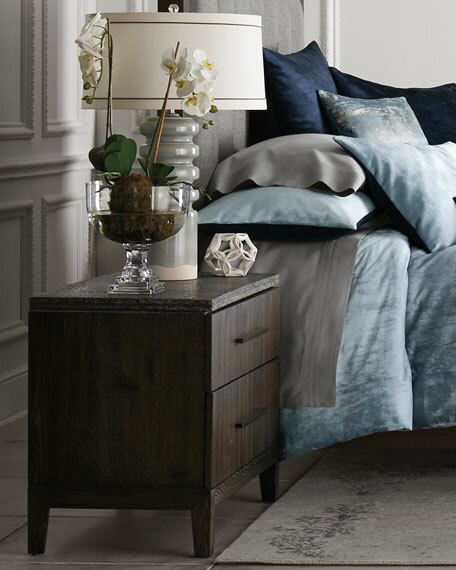 Handcrafted night stand with sand blasted blue stone top. Two self-closing drawers and one electrical outlet. 32"W x 18.8"D x 25.3"T.
Boxed weight, approximately 130 lbs.